Published December 22, 2014 By Leisa Good This post may contain affiliate links. Regardless, I only recommend sites I've researched and/or used and trust. Are you a beginning writer who doesn’t know where to begin to look for work? Are you a freelance writer who would love to have steady work? Are you a writer who is comfortable writing for content mills? Then the content mill, WordGigs, might be something of interest to you. WordGigs is a content mill that uses both beginning writers as well as experienced, professional writers but only in the United States. There are a variety of the types of work there; however, most of the work seems to be article-based with the average article being paid $4.50 for 350 words. Elite writers do make more and to become one of those, you must stick around and earn your merit. There are shorter posts paying around $2.00 each for about 200 words. What is the Pay and When is Payday at WordGigs? Pay is twice a month via PayPal, and can be determined by the agreed upon writing assignment. Payment is paid on the 16th and 1st of every month. Once you create an account with WordGigs, you will be given a grammar and spelling test–all in one. It is actually on about a high school level, so you should be able to pass. However, if you do fail the test, you will NOT be given a second chance. So pay attention. From there, you will watch a short training video. Once that is completed, you may browse the categories and decide which articles to write. The client will provide at least one URL for you to use as research. Articles do have a deadline—although many times it is NOT a tight deadline. What Are the Computer and Equipment Requirements at WordGigs? connection to an online thesaurus. connection to an online dictionary. connection to Grammarly or any similar spelling/grammar checker. Are You an Independent Contractor or an Employee at WordGigs? You are an independent contractor and responsible for your own taxes—like all freelance websites. Should you make over $600 a year, you will be sent a 1099 Income Tax Form—in fact the 1099 and a verifiable PayPal address are required before the first payment can be received. What is My Overall Impression with WordGigs? WordGigs seems to have just as many fans as it does foes. The reviews seem to be very mixed. There are those fast writers who claim to be making $400 or more a week, and there are those other writers who claim it is not even worth their time. Another complaint that I hear is frequent rejections from editors when the writer really feels that he/she followed the prescribed guidelines. How Can an Interested Applicant Apply to WordGigs? Go to their website and create an account. Then submit per instruction your 1099 paperwork and your PayPal address. Be prepared to take a basic grammar and spelling test all rolled into one, but one try only. Good luck to all who apply. This is the most profitable route to take as a freelance writer. You can get your own clients and set your own rates, which you cannot really do with WordGigs or other content sites. A six-figure income is not outside the realm of possibility when you're running your own business. 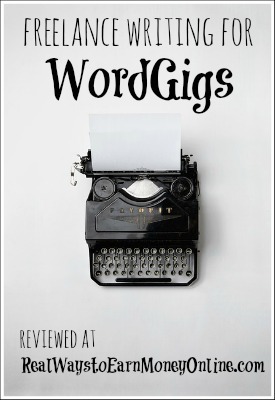 Word Gigs is hiring for ‘elite’ content: ebooks, webpages, 500+ word articles, medical/financial/tech niche. If you get accepted, they set up a phone interview. I tried to apply , but got rejected shortly after i submitted. I think maybe it’s becasue im using a neighbor’s WIFI hotspot or only have a cell phone. I worked for word gigs till I had to change my email and since there is no assistance in word gigs to help a person retrieve their password without access to an older email I can never return. Which includes access to important documents like W2s and other tax information. So they have my personal information and I have no way to access it. No call number no email no contact of any kind outside the official log in. To me that is more than fishy its criminal. @P. Malone – All I can say is “wow”. Did not know that. If you want to be treated with respect, this is not the site to work for. There is usually some work available every day, but the support system is impossible and the comments from the editors can be insulting. If you complain, you will only be insulted more and threatened with losing your status. I got rather frustrated with Word Gigs. Last year, I had an article sent back like 4 times for stupid revision requests. I emailed them and got back a response filled with errors. Their manuals are also filled with mistakes. A bunch of writers quit when they upped the requirements , but not pay, Some of the editors are downright rude. I wrote for them a bit longer after a hiatus only because i needed the money. The website changed designs and I cannot log in. I emailed support and have gotten no answer . I don’t feel I am missing much anyway. It seems they only hire once a year maybe twice. It may work for some, but I think there are better paying gigs. Can anyone from a Country other than U.S earn money through this WordGigs? ?